This beautiful Provencal style house has been finished to a very high standard and stylishly decorated. Light and airy throughout with comfortable modern furnishings. Crisp white linen and soft towels are supplied. Benefiting from air-conditioning, beautifully tiled bathrooms, new kitchen with modern appliances and open plan living area. The property is situated in a peaceful setting with spectacular views across the valley on a private 3 acre site with just 2 other houses. It is approached through electric gates and is uniquely tranquil and private. Surrounded by delightful landscaped gardens with exclusive use of its own large pool (12m x 6m). After swimming, enjoy a game of table tennis in the garden, boules or tennis on the court situated just yards away. (The court is shared with the other two houses.) BBQ lunch under the covered dining area and watch the sun go down with an evening drink on the raised terrace. The house is only a short drive or a 20 min stroll along the lane from Lorgues with its outdoor cafes, restaurants and famous weekly farmers market. A beautiful base to enjoy everything this region has to offer. This is our much loved family home in France which we have enjoyed for the past ten years. We look forward to sharing it with you. En-suite to bedroom 1 with wc, bath and basin. En-suite to bedroom 2 with wc, shower and basin. En-suite to bedroom 3 with wc, shower and basin. Family bathroom downstairs. All beds are dressed in pure white cotton linen. Extra blankets are available. In the utility room a washing machine is available for our visitors use. There is a rotary drier in the garden but you are welcome to use the tumble drier. A supply of logs can be arranged for a small charge during the winter months. Ample parking for several cars to the front of the property. White cotton towels are provided for bathroom use. Coloured towels are available for the poolside. The feature stone fireplace surrounds a cosy wood burning stove. A large open plan living room. Sitting area with comfortable sofas facing TV. Dining table and chairs. Open stone fireplace. Patio doors to outside covered dining area and sitting area. Overlooking pool and garden. Beautiful outlook. Large double refrigerator/freezer with ice cold water dispenser. Fully equipped kitchen with stainless steel pans, plenty of utensils and cooking dishes. Ample crockery, glasses and cutlery. A contemporary open-plan kitchen/living room area. Marble work tops/double sink. Breakfast bar/stools. Overlooking pool and gardens. Built in Bosch oven/hob with extractor. Dishwasher, fridge/freezer, microwave, kettle, toaster. The large wooden dining table easily seats eight adults. The open plan layout, incorporating the kitchen, dining and living area, means dining indoors is very sociable and 'easy'. We have a small selection of paper-backed books which our friends have often swapped after their holiday read. You are most welcome to do your own swap during your stay. Lawns with borders filled with Lavender and Thyme whilst various 'climbers' ramble across the clay tiles. Our Olive trees in the orchard are hundreds of years old. Canoeing on the river approximately 20 mins drive away. A gas BBQ is available for our guests use. The place to relax with a cool drink or eat a leisurely lunch. Share the terrace with the rambling Hibiscus, Wisteria and potted lemon trees enjoying this shady spot overlooking the pool. The villa has its own tennis court. There is also table tennis table in the garden. Golf at Le Muy, St Enderol (approx 25 min) or Barbaroux, Brignoles (30 min). Whilst the veranda overlooking the pool, provides shade in a cool breeze the pool enjoys the sunshine all day. Umbrellas/sun loungers are provided. Enter the pool by the steps at the shallow end. Outside: Large pool (12m x 6m). Heating available at extra cost of £150 per week. Request at time of booking. Weekly cleaner and Pool maintenance included. Sun loungers. Table tennis. Lawned area surrounding the pool. Hard tennis court and boulodrome. Utility Room: Washing/Dryer machines. Cleaning / Towels / Linen / Maid service: Maid changes linen and towels weekly. Linen, pool and bath towels included. Pool and gardens maintained continually. Other: The house is accessed through electric gates. Plenty of parking on level, gravelled private driveway. The villa is immaculate and the description and photos are very accurate. It is in a lovely domaine of a few other houses but very private and feels secure behind the electric gate. It was spacious and airy and we ate all our meals outside where there is shade at all times if you want it. We swam in the beautiful pool, we played tennis on the domaine court as well as boules and we sat and read books in the well maintained garden. The nearby village of Lorgues is a short drive away and definetly worth a visit especially on market day (Tuesday) - lots of bars and restaurants there. Another village nearby worth a visit was Cotignac - picture perfect village with loads of restaurants plus locally numerous vineyards serving exquisite rose wine! The area is pure provence verte with olives and vineyards and lavender. We had to visit both Nice and Marseilles airport during our stay and both about an hour away so very well connected too. I would thoroughly recommend this property - we are fussy travellers and like firm beds and clean houses and this villa ticked all of the boxes and more. We would definetly return to the house. A fantastic property that is exactly as it appears in the photos. 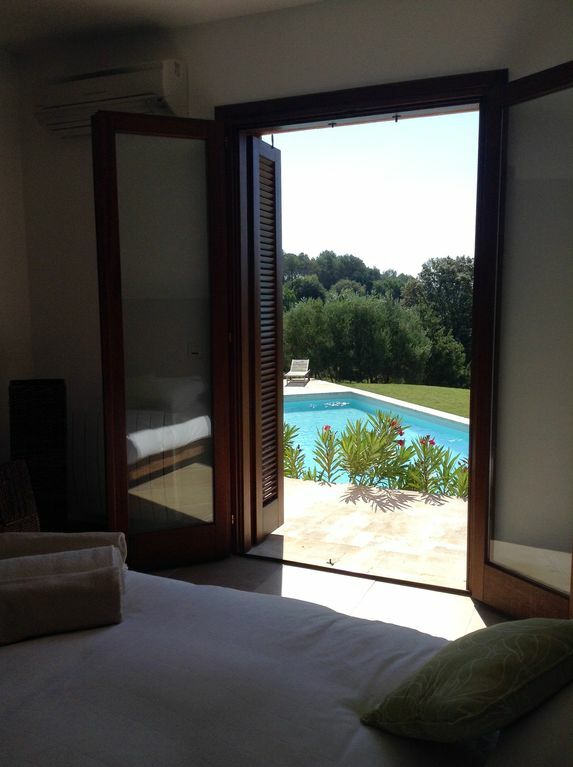 The villa is lovely, with a high standard of furnishing and decoration and the grounds are excellent - well maintained and with a wonderful view, particularly from the double doors in the master bedroom. The surrounding area is abound with pretty vineyards (we recommend a trip to Chateaux Berne just a short car journey away) and is within easy reach of the coast, as well as the beautiful Provencal countryside (Gorge du Verdon and Tourtour are also well worth a visit). The nearby village of Lorgues is very nice and has a large market on Tuesdays that should certainly be explored. The house is well equipped for families, with a large pool (alarmed), boule and communal tennis court. There are only three properties in the small close, all with their own private space and they are behind electronic gates, so very peaceful and secure. The owner was very helpful, accommodating and supportive throughout the process, from booking and arrival, to questions during our stay - even to the extent of providing much appreciated reassurance when we had to visit the local doctor for our 1yr old son, who fell ill during the first week. Illness and some unfortunate weather aside, we had a great couple of weeks and would certainly recommend this property to friends and family - hopefully we will be fortunate enough to visit again ourselves in the future. Closest beaches are at St Maxime, St Raphael, Frejus 30 -40 min. St Tropez beaches, shopping and nightlife 1 hour. Nice Airport 1 hour. Toulon Airport 50 min. Marseille Airport 80 min. Train station Les Arcs 20 min. Car hire essential. Lorgues - cafes, restaurants, shops and weekly market (Tuesday) only few minutes drive or a 20 min stroll along the country lane. Many villages - Tourtour, Vidauban, Entrecasteaux, Aups a short drive away. Gorge Verdon and swimming in Lac de Ste Croix 40 min. Cannes 45 min. Aix en Provence 1 hour. The house is only a short drive (3 mins) to the local supermarket at the end of the lane with fresh bakery, meat and fish counter. You will find everything you need for your holiday in Lorgues - plenty of bakers, banks, chemists, gift shops and newspapers. Buying your provisions in the morning is delightful as the cafes spill onto the pavements. There is a selection of restaurants to satisfy most people's tastes. Chez Bruno, the renowned Michelin truffle restaurant is close by. You will not fail to notice the abundance of vineyards in the area - a visit and wine tasting is a must. Chateau Berne, a renowned vineyard with hotel and restaurant, is only a 10 min drive away.